Update (July 8, 2016): Congratulations to our winners: Quinne A., Chris B., and Callie H.! Thank you to everyone who bought tickets in support of CUESA’s education programs, and to the restaurants who donated! 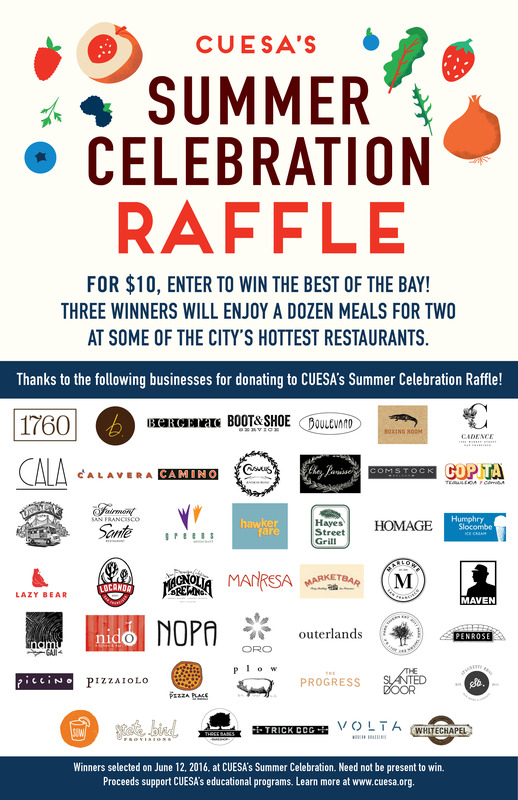 As part of CUESA’s 6th Annual Summer Celebration on June 12, we’re raffling off three sets of 12 gift certificates for dinner for two at some of the Bay Area’s best restaurants! Purchase the $10 raffle tickets at the Ferry Plaza Farmers Market Info Booth on Tuesdays, Thursdays, or Saturdays, or in the back plaza on Saturdays from 8 am to 12 pm; at the Jack London Square Farmers Market Info Booth on Sundays, 9 am to 2 pm; or at Summer Celebration on Sunday, June 12. Participating restaurants include: 1760, b. Patisserie, Bergerac, Boot & Shoe Service, Boulevard, Boxing Room, Cadence, Cala, Camino, Causwell’s, Chez Panisse, Comstock Saloon, Sante Restaurant in The Fairmont San Francisco, Greens, Hawker Fare, Hayes Street Grill, Homage, Humphry Slocombe, Lazy Bear (priority reservations included), Locanda, Magnolia Gastropub and Brewery, Manresa, MarketBar, Marlowe, Maven Restaurant, Namu, Outerlands Café, Park Tavern, Penrose, Piccino, Pizzaiolo, The Progress, Plow, Spaghetti Bros., State Bird Provisions (priority reservations included), Three Babes Bakeshop, Trick Dog, Volta, and Whitechapel.